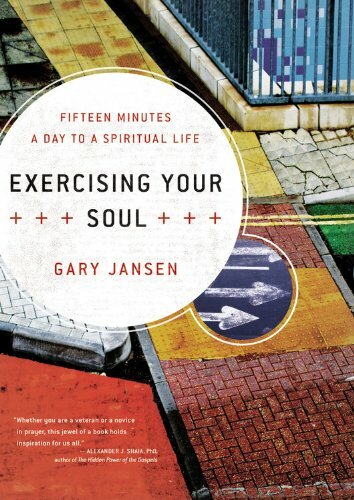 The following is a passage from “Exercising Your Soul” by Gary Jansen. I highly recommend this book! “A man stood outside a church in the middle of a busy city and watched as passersby went about their daily business. Many were shuffling off to work, others were walking around in shorts with newspapers and brown paper bags, still others seemed lost and in need of directions. Around noon, the man looked up at the tall steeple and fixed his gaze upon the thin iron cross that sat on the top. Every once in a while a man on his way to lunch or a woman on her way to the drugstore for cotton balls would slow down and look up, too. If the person lingered for a moment, the man would ask, “What is the Holy Spirit?” Many people said nothing and took his words as their cue to move on. Some said, ” I don’t know.” Others said words like God, Jesus, grass, smoke, fire, energy, a new line of sports shoes. This went on for hours. As the sun began to set, casting the street in the colors of Sri Lankan silk, and after hours of staring upward, his neck stiff and pinched, the man turned his gaze to the street. Walking toward him was a beautiful woman in a sundress. With the sun shining on her she looked as if she was radiating phosphorus. ” What is the Holy Spirit?” the man asked. The beautiful woman smiled, looking like an angel from God. She raised her hand, her fingers painted in Technicolor, and slapped his face with the strength of a small Balkan army. “That’s the Holy Spirit.” she said and walked away. The man, his cheek burning with the fire of God, knew exactly what she meant. A post (not by myself) on the Holy Spirit. Haha, very accurate.